Portia has 3 wishes for XP Days London 2008. I second those wishes. Why? 1. 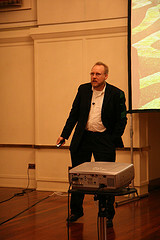 David Stoughton’s opening keynote. I’ll explain why tomorrow. 2. Chris Matts’ keynote. Or a session, at the least. I attended Chris’ session on Real Options last year. I still have trouble explaining ‘Deciding at the latest responsible moment’. People think I’m crazy when I talk about it. I need help. 3. A closing. Doesn’t have to be a keynote. At XP Days Benelux we close each day with POOMPs (Participants Official One Minute Presentations), where participants get 60 seconds to talk about a session they attended, mirroring the 60 second presentations by the session organizers in the morning. This year, we also presented the results of a retrospective of the conference. 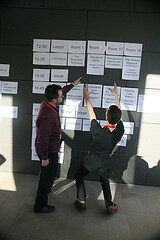 Last year, participants presented Zen impressions of the conference. Saying goodbye can be fun! Participants to XP Days Benelux seem to like it. So, that’s my three wishes gone. The Genie is back in the bottle. Portia Tung and Duncan Pierce hosted the “Yellow Brick Road” session. 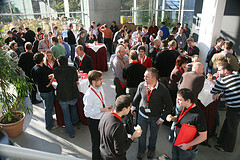 The session kicked off with some speed-networking, which was excellent to get us moving after the coffee break. Then we bubblesorted ourselves, based on the agility of our organisations. We formed groups of three, with similar organisation backgrounds (“just started with agile”) for the remainder of the session. I worked with Douglas Squirrel and Simon Woolf. Portia and Duncan had prepared some cool cards with characters from the Wizard of Oz. We had to choose a character that we identified with. Guess which one I chose. We each identified some difficult situations we struggled with. Unsurprisingly, we had several of those in common. Each of us took turns exploring one of the situations, with another participant “playing” the role of someone else in the situation by asking questions. The third participant acted as observer. It was really fun “acting” like a person you don’t know, just by asking questions. It helps to explore the situation and your feelings when you’re act as if you’re “in” the situation and someone keeps on “investigating” you while pretending to be one of the characters in the situation. In the end, we get to be the character we want to be. We have the heart, the brains and the courage. We just have to use them. Each of us filled in 3 (white) bricks with SMART actions we will take as the first steps on the road to Oz. One of my tasks has already been planned: in less than three weeks I will lead a retrospective for the largest project at my customer. This one earns me double “points”, because this task is also on my “short term evidence”. These are the goals that I set myself to achieve before the end of 2007, during Bootcamp. This session had a good mix of short, timeboxed tasks for the participants and explanation from Portia and Duncan, so that the session kept “going”. The energetic start, with speed-meeting and bubblesorting, got everybody moving and made you work with two people who you had never met, but had a lot in common with. This kind of session is ideal at the start of a conference. 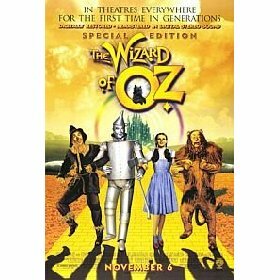 I really like the idea of using fairy tales, stories and metaphors to look at a situation from a different angle. To make this session perfect, I would make the use of the characters more clear and constrain the exploration of the situations a bit more. This could be done by making the rules stronger (e.g. “only ask non-closed questions”) and making the actors stick to their chosen character. Hmm… which other fairy tales could we use to apply to projects and organisations? Portia will host a session at SPA 2008 (16-19 March). I’ll be there. Hope you will be too. And then we were off to the nearby pub for Guinness and mash and steak/chicken pie. And lots more talking with old and new acquaintances from around Europe and some crazy, crazy Finns. The Eurostar and the underground brought Rob, Gino and me to the Glazier’s Hall in time for the opening keynote by Jeff Paton. This was an entertaining presentation about iteration, with old rockers as personas and including bits of music to underline the message. The talk focused on iteration as a means to embrace change. Roger the customer sees each story as just “one more brick in the wall”, purely incremental development. Each iteration delivers a few more working stories. Yes… but what if we discover some new information about these stories? What if the story isn’t really done? Where do we find the time to improve, to iterate? Because we promised Roger to deliver more stories in the next increment, there is no more time to iterate. So, slip the release or make Roger unhappy? Enter John, Paul, Pete and Roger. Each offers us a handy strategy in a song. John tells us to “Follow the money”: we’re in the business of producing business value. So, ensure you know what value each and every story brings. Paul has lots of ways to leave his lover, and lots of ways to do everything that must be done on the project. He tells us to choose as late as possible, to leave our options open as long as possible (remember: Lean and real options). 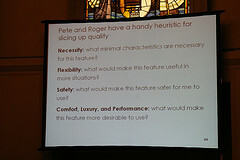 Pete and Roger have a plan and a handy heuristic to slice up quality (see picture above, click to enlarge): they can implement any story up to several levels of quality. First they build based on necessity; then flexibility; then safety; then comfort, luxury and performance. Like in the Dimensional Planning method: build a basic version of the story in the first iteration, improve it in the next iteration. Plan to iterate! 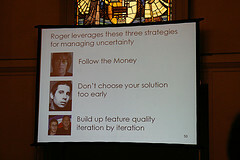 Pete and Roger have a good thing going: they always have a working system; their customer is often satisfied with a story implementation that does not have all the niceties; they have time left to ensure that the crucial stories are completed with full luxury; they have enough time to iterate, to embrace change. Those are the stories that delight the customers. Because in the end we, like Johnny Rotten , “Don’t know what we want, but we know how to get it!”. This was an excellent keynote: questioning common practice, clear slides, a sustained methaphor (old rockers as personas by a User Centered Design specialist), sparing but effective use of music (at least for those in the audience to recognize the old geezers…) and enough humour. This presentation was recorded. I’m looking forward to seeing the presentation again. Michael Feathers’ session was packed full. The presenters in the Gary Weston room in Southwark Cathedral (XP Days has expanded to fill two more rooms in the cathedral) always seemed surprised that so many people came to their “Peopleware” session. 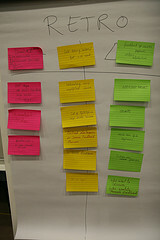 In this session, we explored the important aspects of organisations that impact the introduction and survival of agile. Afterward, each group explored one of these aspects in depth. In my group, we explored the effects of an organisation that is mainly organized around projects vs one that is organized around product development. Each model has its advantages and disadvantages. Maybe a combination of both can bring us the best of both worlds. Or the worst of both worlds. I took the notes for our group. These will be published on a wiki. I’ll let you know when the results are available. And then it was time for lunch and 3 more sessions in the afternoon. Elizabeth Whitworth presented the results of her research into collaboration and communication on agile teams. She interviewed participants in agile teams about motivation, excitement, “team chemistry” and positive “team climate”; what makes a great team great? Elizabeth’s presentation could have been a bit more “Zen“: less info (we can find that by reading the thesis), more passion, more fun, more about what the people in those teams said and felt. An interesting presentation, we need to know more about great teams, so that we can create more great teams. After the explanation, we got to create an exceptional message. We had two rounds. In the first round, each group created a message. In the second round, one member of each team went to another team to hear the message. The team then used that feedback to improve their message. Again, I experienced the power of positive feedback: the second version was a lot better than the first. This was a too short, but fun session. This session, hosted by Portia Tung and Duncan Pierce, was one of the highlights of the conference. I’ll post an entry about this session tomorrow. Thanks to Lasse Koskela for the use of his pictures. On Friday, we had fewer, longer, more interactive sessions. We also had a few participants less than on Thursday. 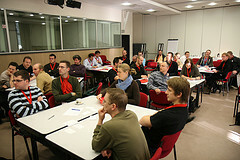 Apparently, thursday’s program with its shorter sessions was more appealing for participants who attended only one day. After the OOMPs, the EMC team discussed the role of the product owner, while the Sirris team presented the application of agile in projects where more than software is involved. The Security architecture workshop let participants experiment with defining and attacking security measures. I attended the Agile Requirements session, led by Dave Nicolette and Lasse Koskela. We were supposed to write user stories, based on a (very brief) paper spec and with the aid of roving product owners Dave and Lasse. 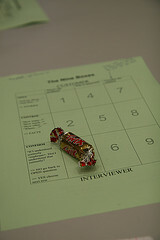 After the first round, the teams demanded an onsite customer/product owner because things went too slowly. So, one participant in each team acted as product owner, answering the team’s questions. Things went a bit smoother. As Dave writes, the session veered off into a discussion about product owners and requirements. At one moment a team said their product owner was overwhelmed by being asked questions by 4 people and suggested to deputize one of the developers to talk to the product owner. A lot of discussion ensued about the (dis)advantages of this tactic. I agreed with Dave when he said that someday this whole team is going to learn to work together, so why postpone the learning by excluding part of the development team? In the end, the whole discussion was academic, because, when we asked, the team’s product owner was not overwhelmed at all. He was doing fine. The team was (in Core Protocol terms) rescuing their product owner, helping someone without being asked to help. This doesn’t help, it only makes things worse. We’re better off treating all participants in the story writing exercise as adults. If the product owner is overwhelmed, they can say so. Everyone on the team is responsible for taking care of themselves. Laurent Bossavit presented personal productivity tools in Agile as lifestyle. As one participant said at the POOMPs: “It’s already changed my life!” The EMC team discussed release management and committing to fixed release dates. 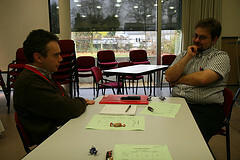 Nat Pryce and Steve Freeman hosted the Sustainable TDD session, for those practicing TDD. Keep your test as clean and clear as your code (if not clearer and cleaner). Koen van Exem and Walter Hesius presented Dimensional Planning, a way to get more value out of planning by considering the “depth” of implementation or refinement of a user story. I like the idea. Something similar came up in Jeff Patton’s keynote at XP Days London. Nicole Belilos hosted a retrospective about the conference, which gave us useful feedback for next year’s conference. You demonstrate at every step that you understand the customer, which gives them the assurance that you know what you’re doing, that you are on their side, that you really want to solve their problem, not just sell more of your product. Dave Nicolette has a fantastic write-up of the session. The people from the Solution Selling blog responded. The 9 boxes is just one of the many useful techniques of Solution Selling. Buy the book or, even better, follow a Solution Selling course. This is one of the two most useful courses I have ever followed (I will tell you more about the other later). George Ataya gave a clear and funny presentation about senior management concerns. If we wish to be understood by senior management, we should state our problems and solutions using the framework given by the presentation. The presentation was followed by an exercise where we tried to do that. Unfortunately, the session was a bit short and I had to leave early to start the wrap-up and cleanup of the conference. I want to know more about the subject. I learned some more at XP Days London. The conference closed with the final POOMPs. This time we had changed our process: we asked people to stand up if they had been to a session. It’s a lot easier to talk if you’re already standing up, so we got a lot more people to tell us about their experience at the sessions. The presenters got a bottle of “Carolus” beer before we went to the bar to continue the many conversations. 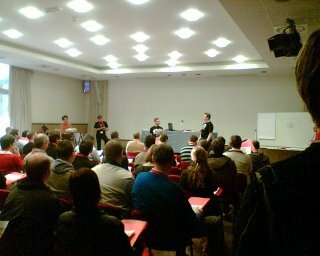 XP Day Benelux was great: lots of smiling faces, lots of discussions inside and out of sessions, enthusiasm, energy. 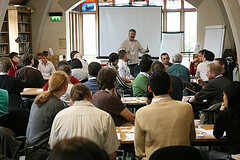 The participants go back to work with fresh ideas and renewed energy. 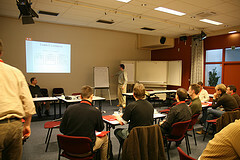 You make XP Days Benelux 2008 better with the ideas you give us during the conference and on your feedback forms. You can make it even better by hosting a session or by participating in the organisation. XP Days typically start with a pre-conference dinner with those people who arrive the night before the conference. We had a nice dinner and a few glasses of the local “Carolus” beer in the center of Mechelen, before we headed back to the conference center to meet more people arriving. At the start of the first day, our MCs Rob and Johan welcomed the participants and let the presenters do their “Official One Minute Presentations” (OOMPS). Each presenter gets 60 seconds to advertise their session, usually in a creative and fun way. On the left, Emmanuel and Bernard advertise their “Frictions/Creations” session by acting the roles of developer and customer. These wacky intros immediately set the right mood for the rest of the conference: we don’t take ourselves too seriously. 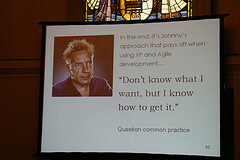 At XP Day London, the presenters only got 10 seconds, which doesn’t allow you to say more than your name and session. It’s less fun. I didn’t attend many sessions on Thursday. I spent most of the day organizing, talking and presenting the “XP Loops“. From the pictures and reactions, I missed some great sessions. The “TDD Randori” is a fun way to experience TDD: participants rotate in and out and have to collaborate on developing some working code. The fishbowl discussion during the session was new to most people, but many participants indicated in their feedback forms that they would like to try it out further. Meanwhile, Yves and Ignace Hanoulle played their new “Communication Game.” I’ve participated in all their previous games, so I hope I will be able to play this one too at another event. We had scheduled a set of short presentations of beginner and advanced subjects on thursday, for those people who want to get a taste of agility. Xavier Quesada presented a case study on SCRUM in two large organisations. I didn’t attend the session, but Xavier sent me the slides beforehand. I really liked the “Zen” style of the presentation, telling a story and showing lots of pictures of the team in action. Marco Janssen presented a case study of agile, fixed price, offshore projects. 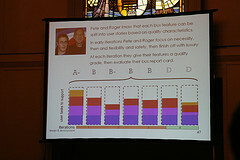 Marc and Willem presented the cultural patterns of software organisations, based on the work of Gerald Weinberg. I would have gone to Marco’s presentation if I wasn’t presenting the “XP Loops” with Vera at the same time. What poor planning by the program committee 🙂 Vera and I had to improvise a bit at the start of the session because the beamer didn’t show any red. We later found out this was caused by a bad cable. In this presentation we talk about the XP practices, but focus on the underlying values. The practices are a means to get the values. Please use any practices you like, but don’t compromise on the values if you want to be agile. This theme came back at XP Days London. Vera and I will present this session at the “Katholieke Hogeschool Mechelen” next week. It’s important to expose agile ideas to the IT and business people of tomorrow. I already see developers who have known nothing but agile, for whom “waterfall‘ is a quaint notion from olden days. If you need someone to talk about agile or lean to IT, economics, business or engineering students, contact me. Sven Gorts and Olivier Costa offered a welcome note of scepticism and described the “dangers of blind adoption of agile methods“. Jan Van Reusel and Ilse Dierickx have been running retrospectives in their teams for more than a year. To keep the process fresh and productive, they have distilled some useful patterns for holding retrospectives. The EMC team explained how they test their complex hardware/software product. The surprise hit of thursday was the “Pomodoro technique“. Matteo and Federico presented this deceptively simple time-management technique. Lots of people inidcated they would try out the pomodoro at home and at work. See the slides and the OOMP promo or read the original article. The pomodoro was successfully exported to Belgium. While Emmanuel and Bernard simulated different modes of interaction with customers in “Frictions/Creations“, the Sirris looked into ways to choose the optimal content of a product backlog. Boris Gloger and Patrick Steyaert combined Scrum and CMMi for process improvement. Lasse and Markus hosted another technical session about “Reading code without psychic powers“. At end end of the day, we had the now traditional “POOMPs”, Participant’s Official One Minute Presentations, where participants speak about a session they attended. We had some trouble getting enough volunteers to talk, so on the next day we changed our POOMP process..
After the conference we had a few drinks and a dinner, where lots of scary plans were hatched. More about some of those later. The fun continued in the bar, where participants sampled some of the fine Belgian Beers. Don’t take my word for it, read what others have to say about the conference. This page also contains the results of the feedback forms. All feedback is public, you can see if we take the input into account in the next editions. We use the “perfection game” from “Software for your head” to help us get actionable, useful feedback. More about Friday in the next post.